When Jeff Prah, chief engineer and coordinator for Technology Training, arrived at Northwestern University’s Medill School 15 years ago, he had a vision for using the Internet to connect campuses and field units for newsgathering. Using Sony's PWS-100RX1 wireless streaming receiver, Prah has finally brought that vision for cost-effective video communications to life, connecting student news anchors and field reporters wherever there's 4K/LTE cell service, Wi-Fi, or an Ethernet port. According to Prah, the system helps his team realize significant cost and time savings. “We've been spending more than $3,000 per month for the leased fiber lines that this system replaces," said Prah. "It can completely change the way a significant part of the media business operates." Traditionally, video transmission has required fiber, satellite, or microwave connections to achieve broadcast quality and reliability. Each have served well over the years for different applications like linking remote studios, news trucks, and camera crews For Prah, this has now become "old school" broadcast technology. The PWS-100RX1 is a network receiver that enables high-quality live streaming from compatible camcorders on a single 4G/LTE cellular channel or Wi-Fi network. Sony's QoS (quality of service) technology or MPEG2-TS maintains video and audio integrity. It features reference and timecode connectors for synchronous operation with broadcast systems and can output in a variety of formats including 1080i and 720p. The system comes with Connection Control Manager software to connect with cameras and to manage live streams. The system is compatible with 4G/LTE or Wi-Fi dongles or the CBK-WA100 and CBK-WA101 wireless LAN adapter. Several XDCAM camcorders have built-in live streaming upgrades. Prah received the PWS-100RX1 at the start of the winter term, just in time to put it into play for its first real-word test—President Obama’s State of the Union address. Each term, students study in Washington, DC with the "Medill on the Hill" program for political journalism. 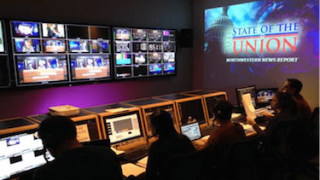 Connecting a studio on the main campus in Evanston, IL with a satellite studio in Washington, DC over fiber for live coverage of events there has been a staple of "Medill on the Hill" for some time. Conducting this project for undergraduates over the internet is a new development. "I didn't have to do anything special on the IT side,” said Prah. “There was no IT director, no third-party person to deal with. I knew the destination IP address and just plugged it into the server. We did this very quickly, and didn't have any testing time. We did get stuck working through one firewall at the Capitol that we could have worked around. But this actually showed what was possible under less-than-ideal conditions." The setup combined a roundtable of reporters alongside student commentators at the main studio and roving reporters at the Washington bureau. The center of the event was a live feed of the address, courtesy of a local television station. The PWS-100RX1 was located in Evanston with the accessory transmitters at the endpoints at multiple locations in Washington and at the local TV station. "The quality was exactly what we expected,” Prah said. “The TV station was amazed at the quality of what our students were able to produce. It was stable, good-looking video. We maintained a full 6mg/s for maximum performance throughout. What's completely unexpected is how stable this has proved to be over time. We've had one of the Washington transmitters up since that day, a few months now. We've seen zero packet loss over that entire period." After this success, plans are now underway for full implementation of the technology. Medill is creating a new 16,000-square-foot facility in downtown Chicago as well as a San Francisco satellite studio, a West Coast version of "Medill on the Hill." With the PWS-100RX1, they all can be linked since there are no ongoing costs after the initial investment in the equipment. "Our ability to use this for connectivity to multiple sites makes this an invaluable product. We are not just limited to one or two systems, but can connect everywhere," Prah said. Using the system for electronic newsgathering applications with XDCAM camcorders with built-in transmitters is crucial because many Medill grads will find themselves operating as "VJ's" - video journalists out in the field solo with the camera and microphone linked back to the studio via cellphone data. "Our students have asked for this because this is what they are seeing on their internships. This is what electronic newsgathering is about today," said Prah. The system is designed to operate on a hub-and-spoke model with remote transmitters reaching in to the central receiver. But it is also possible to set up duplex systems with receivers at both ends for real-time dialog. "This is cost competitive enough to have servers at both ends. That's the next level, transmitting full duplex back-and-forth to send and receive. The latency is fantastic, so we may use these for distance learning applications, too," Prah said. "Much of what we do at Medill is anticipate the future of journalism. Our hope is that our students won't be just working in it - they'll be helping create it. The PWS-100RX1 is a crucial tool, a breakthrough product, to enable such creativity," said Prah.